Growing up in a small community in Prince Edward Island, Tanya Veer-Casey was very familiar with the top cop in the town. He was the only officer in the department and everyone knew him well. Her wish has come true even though it took some time. 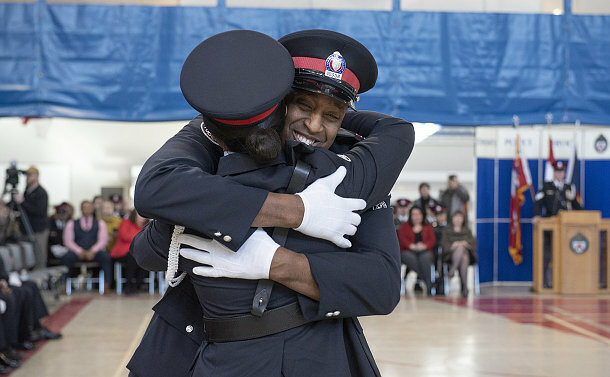 Veer-Casey, 49, is the oldest recruit in a class of 55 presented with their badges at a graduation ceremony on January 31 at the Toronto Police College. After completing high school in the 1980s, she pursued marketing & international business studies at McGill University. Her father was a senior pathologist while her mom, who died in May 2017, was the first female member of the University of Prince Edward Island history department. Tired of selling widgets, Veer-Casey left the advertising sector after 10 years and became a fund development specialist for charities in the Durham region. With interpersonal skills and life experiences, Veer-Casey feels she is going to be an asset to Canada’s largest municipal police service. 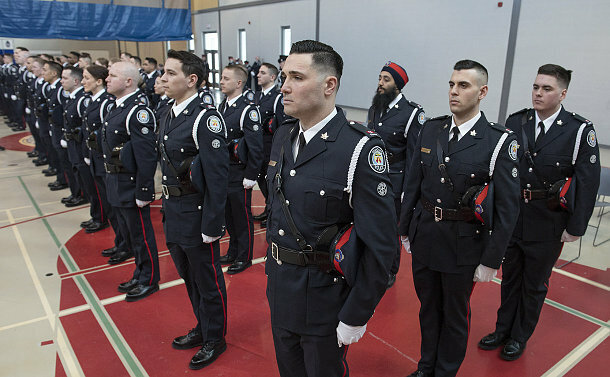 “I started the process to be a cop two years ago and here I am as the eldest in the class and proud of it,” said the mother of two teenage boys, who will serve in 43 Division in south Scarborough. Daniel Crawford was also motivated at a young age to be a police officer after a cop delivered a motivational talk to his Grade Two class. He spent nine years preparing for a policing career. After completing the police foundations program at Fleming College, Crawford did post-graduate studies in emergency management & business continuity and volunteered with Victim Services Barrie, Crime Stoppers and St. John’s Ambulance. He was also the security supervisor for almost five years at Southlake Regional Health Centre. 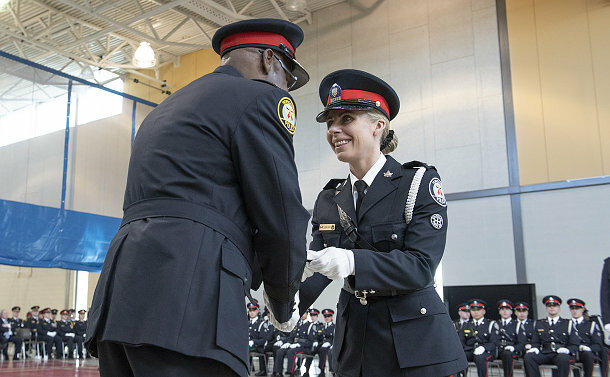 “Nothing comes before its time and I am so happy and proud to be a member of Toronto Police,” said Crawford, who is assigned to 33 Division – the east side of North York. Sharing a home and work environment with her husband doesn’t bother Yoko Maliszweski. Constable Edward De Nobrega, who joined the Service three years ago at age 41, has been her inspiration in many ways. Six months into the job, he became a paraplegic after a tumor was removed from his spine. De Nobrega presented the badge to his wife of 11 years with the aid of walking sticks – he currently teaches at the Toronto Police College. Maliszweski will serve in 14 Division, where her husband first started his career. Maliszweski, an accomplished Muay Thai fighter, was the recipient of the Harry Mayzel Leadership Award. 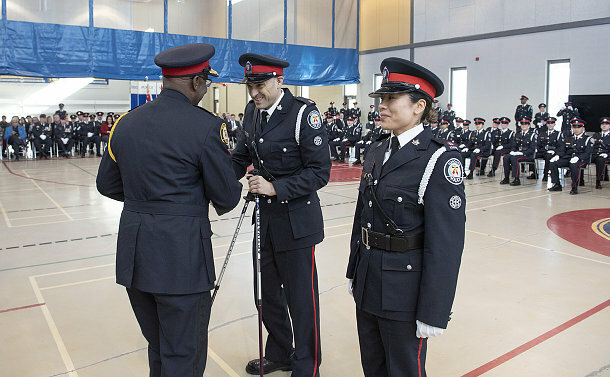 A decade after arriving in Canada as a refugee, Alain Arakaza is the first Burundian to be a Toronto Police uniformed member. He and his two brothers fled the civil war in 2007 and spent two years in Kenya. 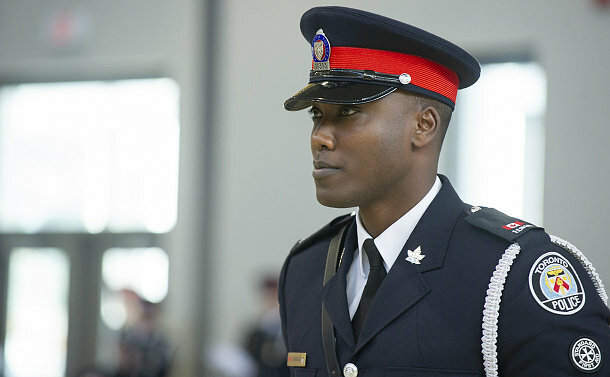 After almost three years as a Canadian Armed Forces gunner, Arakaza joined Toronto Community Housing (TCH) as a special constable. With Toronto Police hiring freeze lifted in late 2017, he jumped at the opportunity to serve as a police officer. Dana Gidlow, the president of the Toronto Police Military Veterans Association, presented Arakaza with his badge at the graduation ceremony on January 31. Arakaza was presented with the Military Veterans Award for drill, dress and deportment. 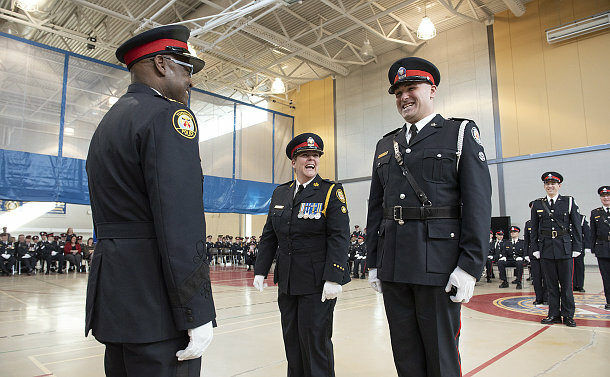 In welcoming the recruits to the fold, Chief Mark Saunders told them the demand for responsible, accountable and transparent policing is extremely high. The new class brings extraordinary language skills to the Service with 42 per cent speaking more than one language. A total of 35 per cent are visible minorities. Toronto Police Services Board Chair Andy Pringle told the graduates that their diversity mirrors the city. With the Service undergoing major changes as it modernizes, the new members are joining at an exciting time in the organization’s history. Acting Supt. Kim O’Toole, the TPS College Unit commander, heaped praise on her team for the expertise, guidance, mentorship and support they provided to the graduating class. She also congratulated the recruits and reminded them that treating people fairly, transparently and impartially and hearing their voices are critical. O’Toole noted that earning and maintaining trust are among the most significant challenges for police officers. Mayor John Tory, who is a member of the Toronto Police Services Board, attended the graduation. He told the graduates that policing is a career that requires a great deal of courage, compassion and commitment. “You will have extraordinary opportunities that carry the obligation at all times to act in a way that builds public trust and enhances the goods reputation of Toronto Police and indeed the City of Toronto,” said Tory. Jeff Churchill was the recipient of the Glen Cole Memorial Award as the class valedictorian, Peggy Chan was presented with the Diversity & Inclusion Award, Melody Carroll won the High Performance Fitness Award and Patrick McFall received the Most Improved Fitness honour. Nathaniel Curry and Ahmad Sarhan won the Honour Student Awards with a 99 per cent average. The graduating class raised $1,612 from a summer barbecue that was presented to Victim Services Toronto.